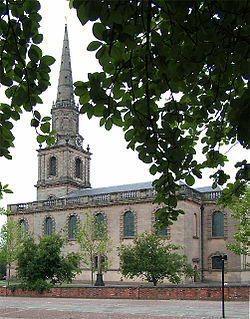 During the recent Open Heritage weekend I visited the church of St John’s in the Square, Wolverhampton. Inside I was delighted to find that the Roll of Honour for the Great War included the name of my great great uncle, Joseph Thomas Westwood, who died in France in 1914 and who, like so many of those who fell, has no known grave. It details the births and deaths of seven generations of the Sparrow family of Wolverhampton from the early eighteenth century until the late nineteenth century and includes names of the parents of women who married into the family and placenames. 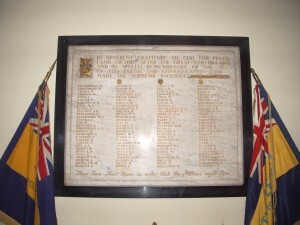 There are 28 names spanning over 150 years of family history on a single memorial. 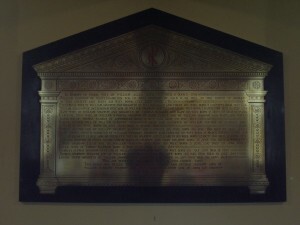 This memorial, erected in 1869 gives details of seven generations of the Sparrow family of Wolverhampton from before 1710 to 1869 and includes 28 names (including the parents of wives),and placenames. In memory of Phoebe wife of William Allen born 1710 died 3 March 1796. William Sparrow of Wolverhampton son of John Sparrow of Talk O Th Hill in the parish of Audley and Mary his wife born 1727 died April 1789. Elizabeth wife of William Sparrow and daughter of William Allen and Phoebe his wife born 5 November 1734 died Dec 1816. 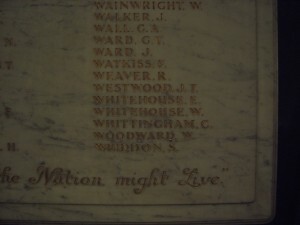 William Sparrow of Pattingham only son of William Sparrow and Elizabeth born 1764 died 10 Feby 1834. Mary wife of William Sparrow and daughter of Thomas Hanbury and Mary his wife born 17 Jany 1765 died Oct 1819. Caroline first wife of William Hanbury Sparrow eldest son of William Sparrow and Mary his wife daughter of Thomas Mander of Birmingham born 19 Oct 1788 died Feby 1822. Sarah second wife of William Hanbury Sparrow of Penn and daughter of William Turton of Sedgley and Elizabeth his wife born 30 July 1803 died 13 March 1834. Robert second son of William Hanbury Sparrow and Caroline his wife born 26 Aug 1819 died 22 Nov 1843. Mary Sophia fourth daughter of William Hanbury Sparrow and Caroline his wife born 15 March 1818 died 11 June 1818. William Hanbury eldest son of Frederick Turton Sparrow and Elizabeth his wife born 27 Oct 1851 died 17 April 1852. John Sly Sparrow of Oxley second son of William Sparrow and Mary his wife born 18 June 1791 died 6 March 1825. Edwin Sparrow fifth son of William Sparrow and Mary his wife born 3 June 1797 died 22 June 1852. Ellen wife of Edwin Sparrow born 5 May 1800 died 16 Nov 1844. Charles Alfred Sparrow sixth son of William Sparrow and Mary his wife born 26 May 1798 died 14 Dec 1803. Thomas Sparrow seventh son of William Sparrow and Mary his wife born 26 May 1800 died 19 July 1844.
Who are buried in the family vault on this Church Yard. This brass was placed here by William Mander and Arthur Sparrow sons of William Hanbury Sparrow and John William Sparrow son of John Sly Sparrow in the year 1869. My twin brother and I were adopted by Lt Col Arthur Alan Hanbury-Sparrow and his wife Amelie and they were two of the most amazing people…we really hit the jackpot when they adopted us. I am in the process of going through father’s family documents and will have a website within a few days. Mary, Hermione, Hugh and Stephen were the living children on father’s side. He died in 1982…an amazing man. Mum died in my arms on 15-3-2000 and I miss them both every day. The names you mention in your blog are those father spoke about over the years. I live in Australia, am a published poet and artist and have three websites and have published over 60,000 pages of data identifying what has been set up on the basis of the new world order. Father said to me “Angela when you are older you will have an unquenchable thirst for the knowledge of God.” This has come to pass and I’ve been deciphering ancient codes for the past 11 years. 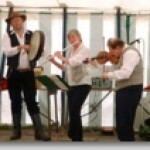 Father never allowed us on the family tree – it wasn’t done in those days Landed Gentry adopting two Heinz 57 varieties out of kindness didn’t give me the right to belong so I watched and learned and read about the family and it’s an great history. Take care in these winter days and I know what you mean about curling up and not wanting to get up on freezing cold mornings. How lovely to hear from you! Please let me have a link to your family wesite when it’s up and running and I’ll include it on here for you. 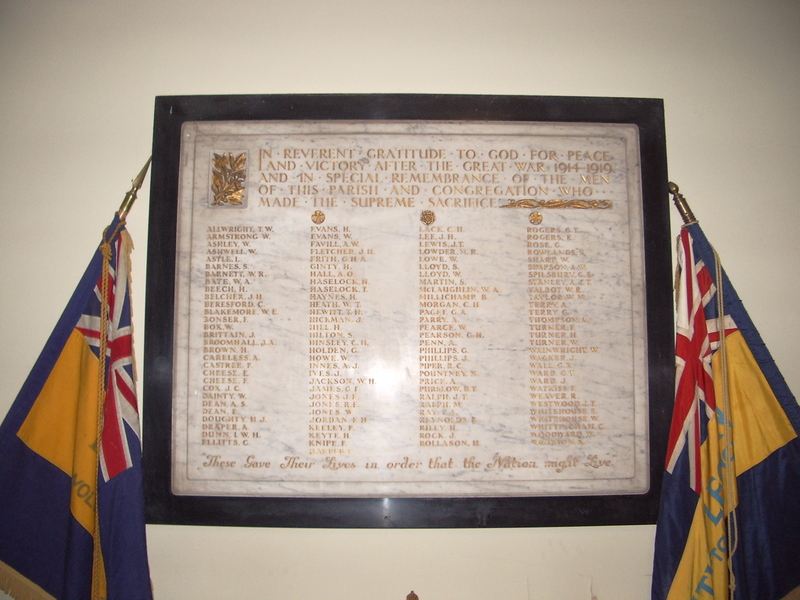 I shall be attending the Remembrance Day service at St John’s and will think of your family. Thank you so much for replying. I found some original trench maps from World War I amongst Father’s belongings. And I’ll publish some of his essays. Will let you know when I’ve got the site up and running. I have been researching Captain Arthur Sparrow, A.F.C., a R.N.A.S./R.A.F airship pilot in the Great War. Sparrow died 0n 16th November 1921 at Weasenham St. Peters. Sparrow’s beneficiaries were Arthur Alan Hanbury Hanbury-Sparrow and John Godfrey Bolle Bosvile. I suspect Sparrow and Hanbury-Sparrow were cousins. Any information you might provide would be greatly appreciated. I’m afraid I don’t have any further information about the Sparrow family, though it does look as though they were related. I’ve emailed you with a contact address which might be of help. Arthur Alan Hanbury Sparrow b 1st April 1892 did have a cousin Arthur Sparrow b 28th December 1892. Arthur Sparrow’s father Cecil Blair Sparrow b 18th June 1859 of Somerton Court is brother to Alan Bertram Hanbury Sparrow b 23 Feb 1863, Arthur Alan Hanbury Sparrow’s father. Could this be the Arthur Sparrow pilot you refer to? Alan Bertram Hanbury and Cecil Blair are the sons of Arthur Sparrow b 28th Nov 1826 of Preen Manor Salop whose brother Frederick Turton Sparrow b 9th Aug 1825 d 29th March 1897 of Habberley Hall Salop is the eldest son of William Hanbury Sparrow b 6th Jan 1789 d 20th Jan 1867 and Sarah Turton his second wife. Thank you for posting this. My partner is related to the Sparrows via Arthur’s daughter Amy who married into the Peel family. She would have been the sister of the Alan (father of LtCol Arthur mentioned in comments) and Cecil Hanbury Sparrow mentioned in other comments. We have been to Church Preen, Church Stretton, All Stretton, and Eaton under Haywood recently where Arthur, Cecil, and Alan are buried and a number of memorials have been built to the family. We are in the process of uploading photos to findagrave and ancestry. We’re hoping to head down again soon todo some more work and may head to Wolverhampton now based on the above. Please feel free to contact me for any photos or info.